A farmer prepping his field for planting rice kicks up a cloud of dust. There is no end in sight for the drought draining Southeast Asia of water. 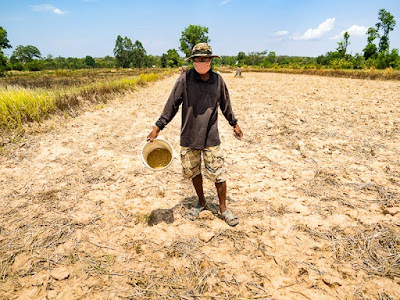 I'm back in Thailand and back to documenting the drought that is wreaking havoc on Southeast Asia. Thai officials had been predicting a normal start to the rainy season, meaning it should be starting in late May or early June and continue through October or November. 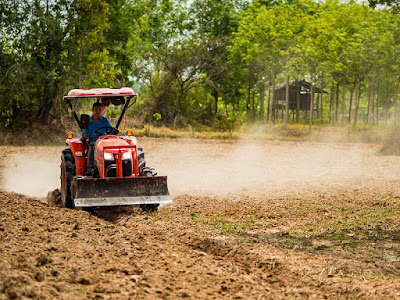 The first warning bells of a late rainy season came just before we went back to the US, when the Thai government asked farmers to delay their rice planting until the rainy season actually started. Traditionally farmers started planting rice in May, confident of rain in the coming weeks. Asking them to delay planting sent a signal that the rains might not arrive as predicted. Earlier this month, the government said the rains may not start on time and predicted that they would start about a month late, in June or July. 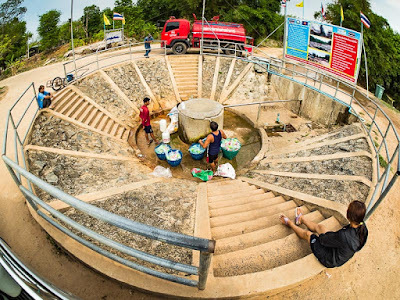 An artesian well in Ban Khana, a village in Surin. I am trying to be strategic in how I cover the drought by identifying stories I can do that illustrate how the drought is impacting people or what people are doing to combat the drought. I went to Ban Khana, a small village in Surin, to photograph both how the drought is impacting the community and how people are battling it. Ban Khana hasn't had significant or meaningful rain since the end of the 2015 rainy season, which was an abbreviated rainy season and well below normal. The village, and surrounding villages, get most of their domestic water from reservoirs and mountain streams. This year their taps ran dry in March. Occasional water shortages, late in the dry season, are not unusual but running out of water months before the rainy season is unheard of. 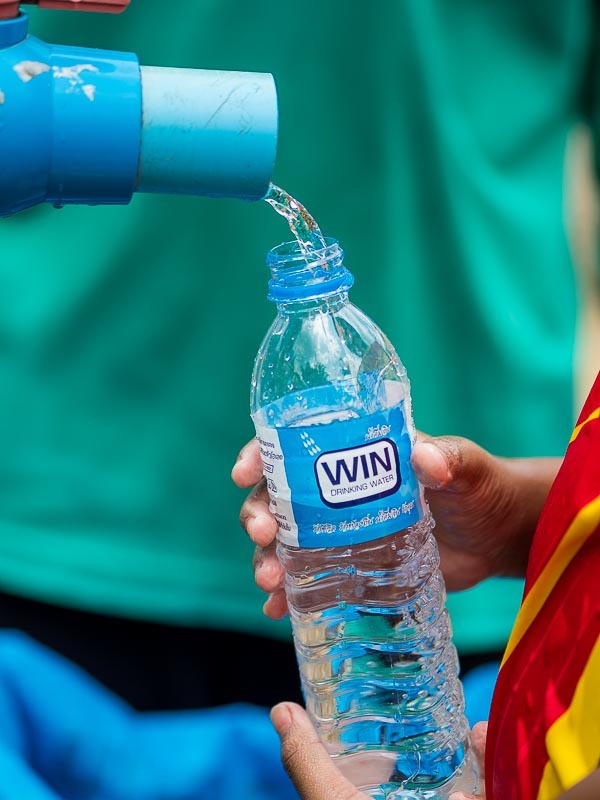 Filling a recycled water bottle at the Ban Khana well. But the people in Ban Khana are luckier than most people in rural Thailand. They have a reliable artesian well in town that has provided fresh, clean water even in the worst of times. And these are the worst of times. There is a fenced off section of the well where people can bathe. A steady stream of people come to the well to fill water bottles. 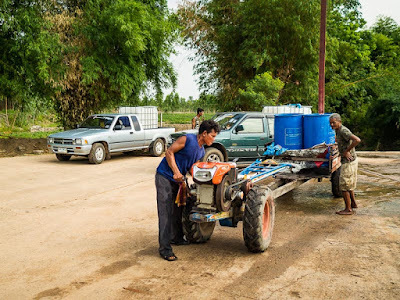 Farmers and water haulers come to the well with their tractors and pickup tractors and fill huge water tanks. People I talked to said they couldn't remember a time when their tap water ran out so early in the year. Sometimes water haulers have to wait hours to get under the giant hoses that fill their tanks. Trucks wait to fill their water tanks while a farmer finishes filling barrels on his tractor. One person told me the well was keeping their community alive but that the increased demand for well water was also a source of concern. He said that before the taps ran dry, it took about 10 minutes to fill a 1,000 liter water tank. Now it takes about 30 minutes to fill a 1,000 liter tank, indicating that water is being drawn from deeper in the aquifer. A person fills recycled soft drink and water bottles from the well. 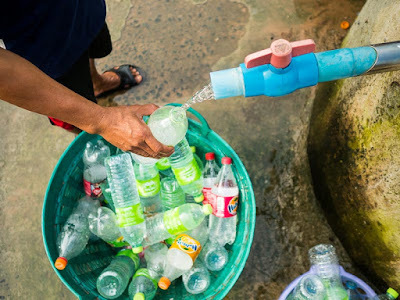 The community doesn't charge people who refill small bottles at the well. Water tankers and commercial water haulers pay a nominal fee to fill their tanks. 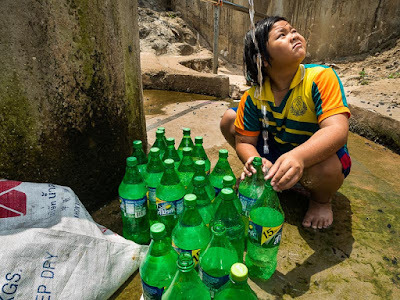 A child refilling soft drink bottles looks up after a thunder clap. The clouds and thunder held the promise of rain but no rain fell in Ban Khana. 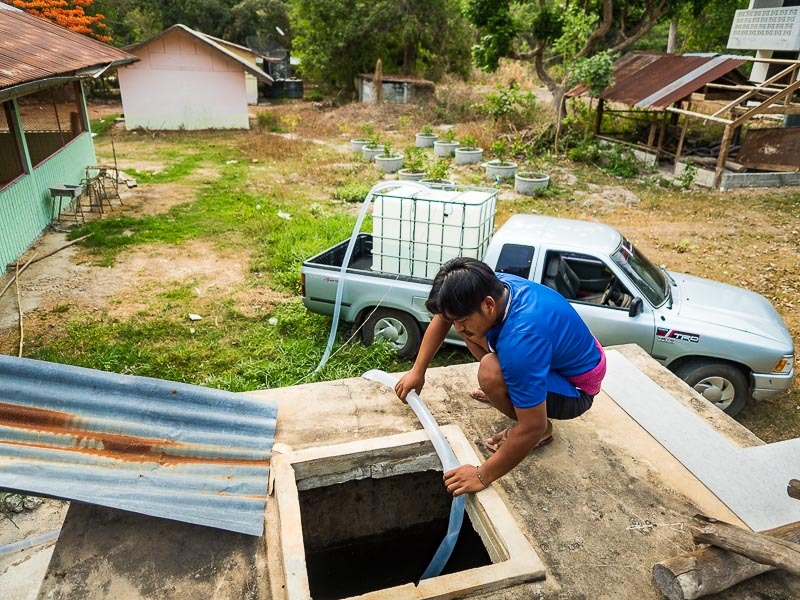 The people of Ban Khana are fortunate to have the well in their community. The Cambodian border is just a few kilometers away (most of the people in Ban Khana are ethnic Khmers and speak both Thai and Khmer) and people on the Cambodian side of the border don't have access to the same clean water. A water hauler fills a cistern at an elementary school in Ban Khana. The school's taps ran dry earlier this year and 100% of the school's water is now hauled up from the well. As important as the well is, it's not a panacea for the community. 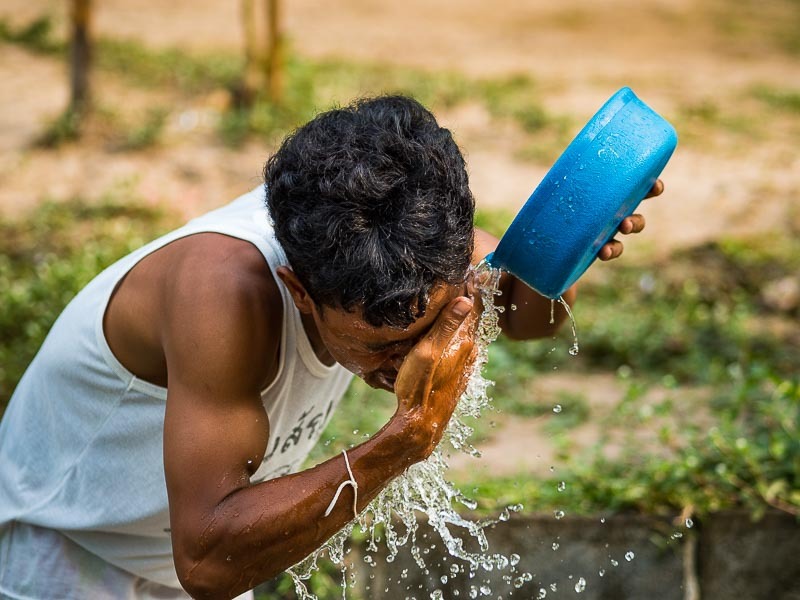 Most of the people in Ban Khana and surrounding villages are farmers and it isn't practical to use well water to irrigate the fields. So while people still have a reliable source of domestic water, they're waiting to plant the crops they rely on until the rains come. A farmer plants rice in a parched paddy. The government has asked farmers to delay their planting but one farmer told me, "what can we do?" 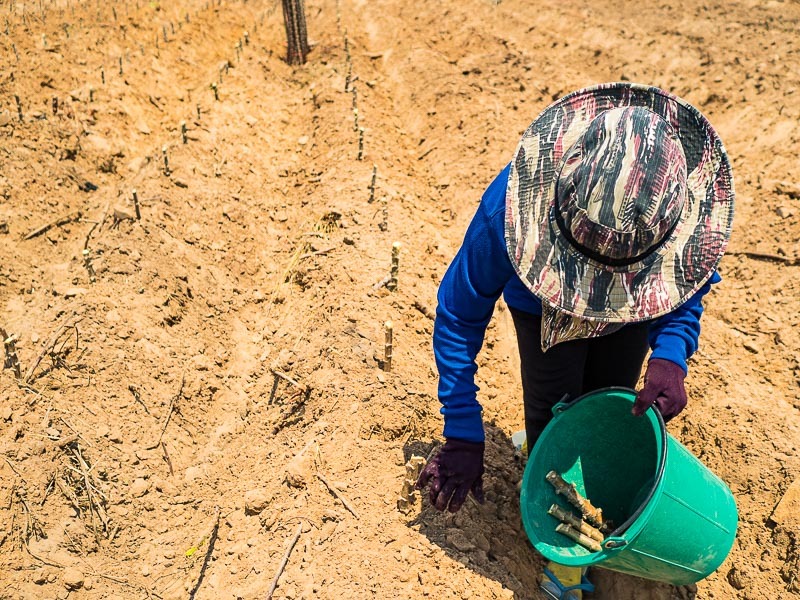 A woman plants cassava in a field near Surin. 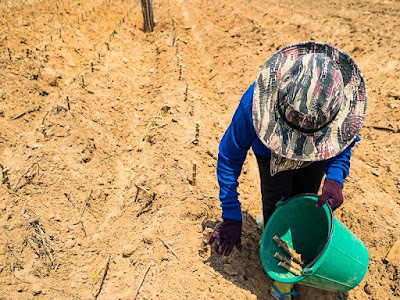 The Thai government is encouraging farmers to switch to drought resistant crops like cassava but even cassava requires water. This field was so dry it was like walking in talcum powder, my feet sank to my ankles with every step I took. It's not so much top soil as it top dust. As desperate as the situation is in Thailand, it's much, much worse in Cambodia. Cambodia doesn't have the infrastructure Thailand has. And Cambodia's farms aren't as well irrigated as Thailand's. So far, I've been covering the drought on the Thai side of the border but I'm planning to go to Cambodia in the next few weeks to cover the drought there. There are more photos of the 2016 drought and the Ban Khana well in my archive or available from ZUMA Press.